In a book inspired by her popular TED talk, New York Times bestselling author Reshma Saujani empowers women to embrace imperfection and bravery. Imagine if you lived without the fear of not being good enough. If you didn't care how your life looked on Instagram, or worry about what total strangers thought of you. Imagine if you could let go of the guilt, and stop beating yourself up for tiny mistakes. What if, in every decision you faced, you took the bolder path? Too many of us feel crushed under the weight of our own expectations. We run ourselves ragged trying to please everyone, all the time. We lose sleep ruminating about whether we may have offended someone, pass up opportunities that take us out of our comfort zones, and avoid rejection at all costs. There's a reason we act this way, Reshma says. As girls, we were taught to play it safe. Well-meaning parents and teachers praised us for being quiet and polite, urged us to be careful so we didn't get hurt, and steered us to activities at which we could shine. As a result, we grew up to be women who are afraid to fail. It's time to stop letting our fears drown out our dreams and narrow our world, along with our chance at happiness. By choosing bravery over perfection, we can find the power to claim our voice, to leave behind what makes us unhappy, and go for the things we genuinely, passionately want. Perfection may set us on a path that feels safe, but bravery leads us to the one we're authentically meant to follow. 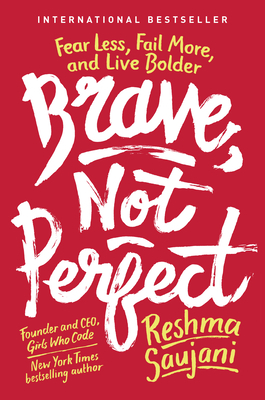 In Brave, Not Perfect, Reshma shares powerful insights and practices to help us let go of our need for perfection and make bravery a lifelong habit. By being brave, not perfect, we can all become the authors of our biggest, boldest, and most joyful life. RESHMA SAUJANI is the Founder and CEO of Girls Who Code, a national nonprofit organization working to close the gender gap in technology while teaching girls confidence and bravery through coding. A lifelong activist, Reshma was the first Indian American woman to run for U.S. Congress. She's been named a Fortune 40 under 40, a WSJ Magazine Innovator of the Year, and one of the Most Powerful Women Changing the World by Forbes. She is the author of three books, including Women Who Don't Wait In Line and the New York Times Bestseller Girls Who Code: Learn to Code and Change the World. Reshma lives in New York City with her husband, Nihal, their son, Shaan, and their bulldog, Stanley.